This project is planned for the investigation of white-headed langur using DNA, and the education of undergraduate students in the foreign field. This year, two undergraduate students, Mr. Koizumi and Mr. Murakami, and a graduate student, Miss. Suzuki visited Chongzuo Biodiversity Research Institute with me. 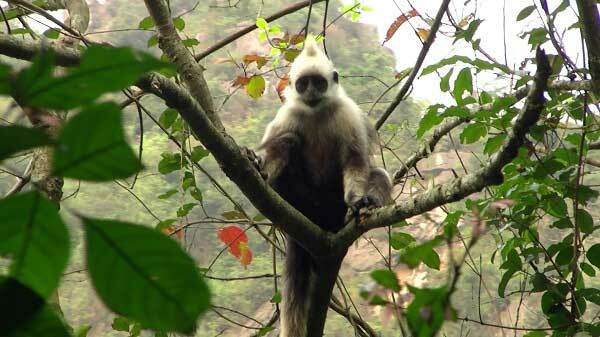 We walked around the habitat of the white-headed langurs every morning and evening to observe their feeding behaviors. As a result, we could observe their behaviors twice from very close stand points to the monkeys. We could collect 37 feces and 64 plant samples with a help of a local guide and collaborators. For the plant species, we are trying to identify the species name from the morphological and DNA barcoding points of views. In parallel with these activities, undergraduate students make their original plans for doing a kind of fieldworks. Mr. Koizumi made a plan for the investigation of plants surviving in the karst hills and their symbiosis. Mr. Murakami studied the difference in the plant species between karst hills and flat fields. The results are described in their reports.